Illegal Immigration – Uncle Sam was Crying… Now he's out to change Washington. The governmental system is highly redistributive. Well-educated households tend to be net tax contributors:The taxes they pay exceed the direct and means-tested benefits, education, and population-based services they receive. 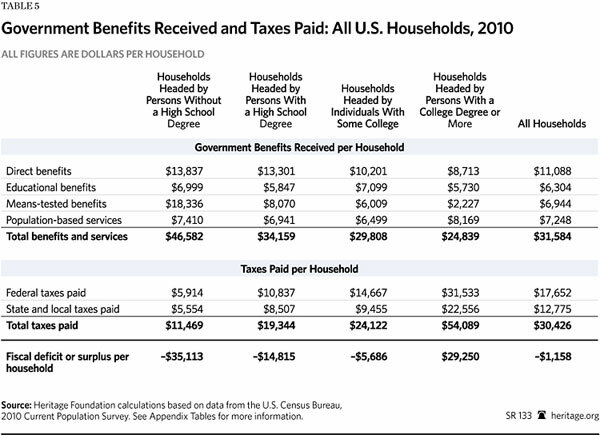 For example, in 2010, in the whole U.S. population, households with college-educated heads, on average, received $24,839 in government benefits while paying $54,089 in taxes. 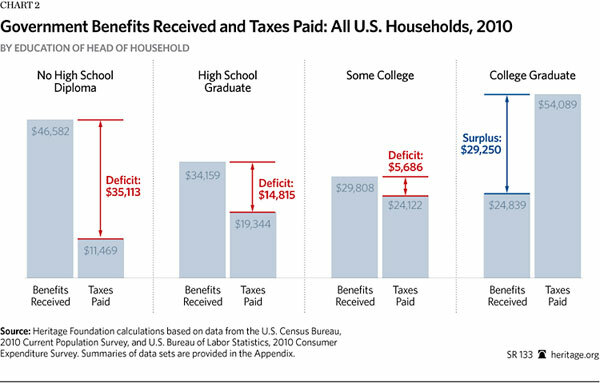 The average college-educated household thus generated a fiscal surplus of $29,250 that government used to finance benefits for other households. 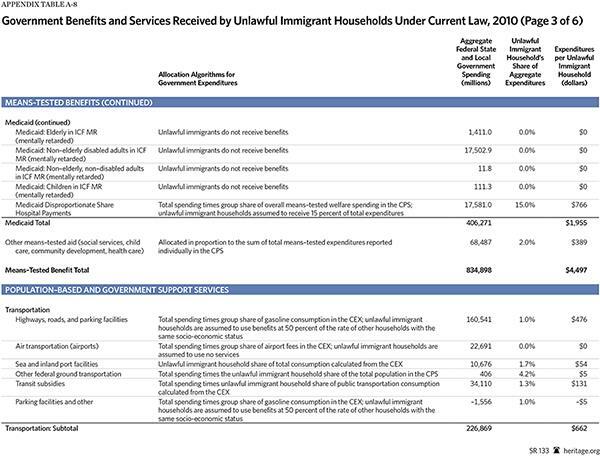 As noted, at the current time (before amnesty), the average unlawful immigrant household has a net deficit (benefits received minus taxes paid) of $14,387 per household. 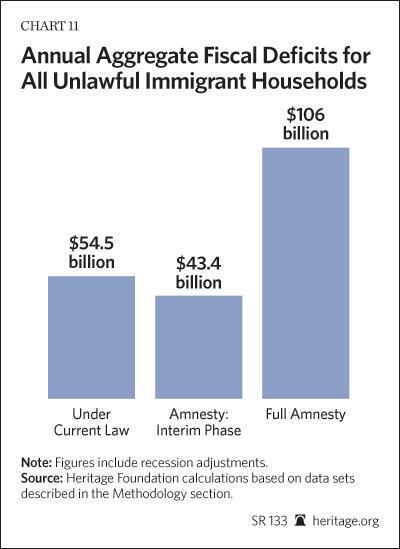 During the interim phase immediately after amnesty, tax payments would increase more than government benefits, and the average fiscal deficit for former unlawful immigrant households would fall to $11,455. At the end of the interim period, unlawful immigrants would become eligible for means-tested welfare and medical subsidies under Obamacare. 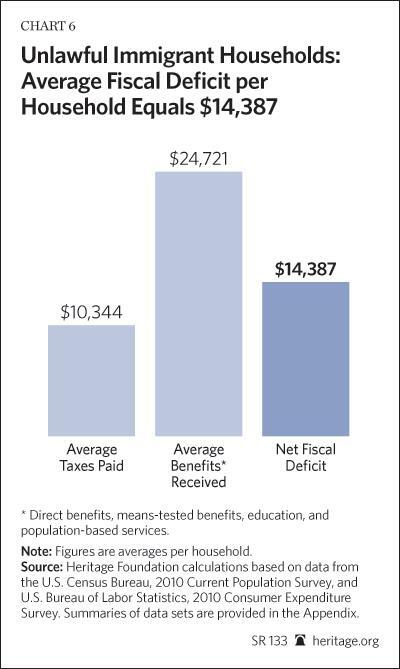 Average benefits would rise to $43,900 per household; tax payments would remain around $16,000; the average fiscal deficit (benefits minus taxes) would be about $28,000 per household. 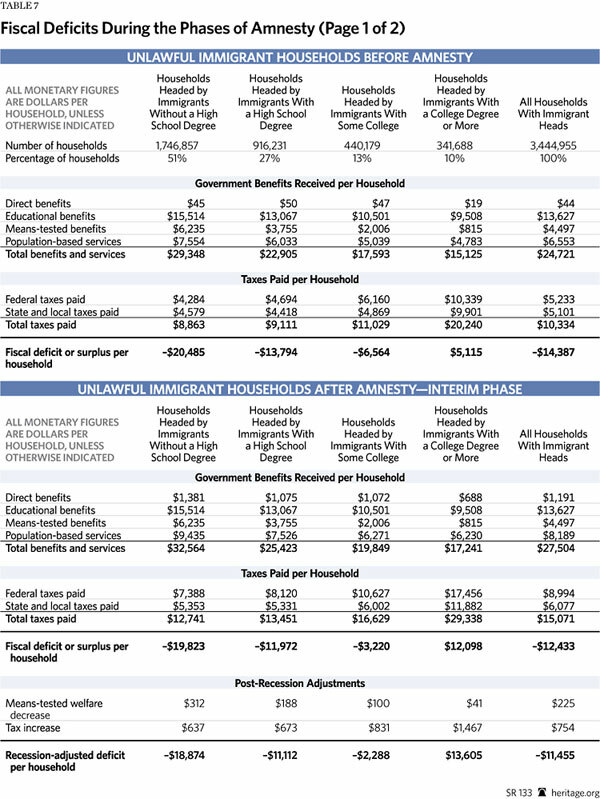 Amnesty would also raise retirement costs by making unlawful immigrants eligible for Social Security and Medicare, resulting in a net fiscal deficit of around $22,700 per retired amnesty recipient per year. 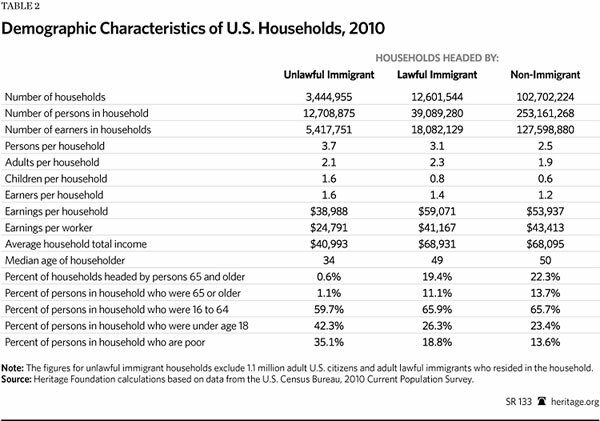 In terms of public policy and government deficits, an important figure is the aggregate annual deficit for all unlawful immigrant households. 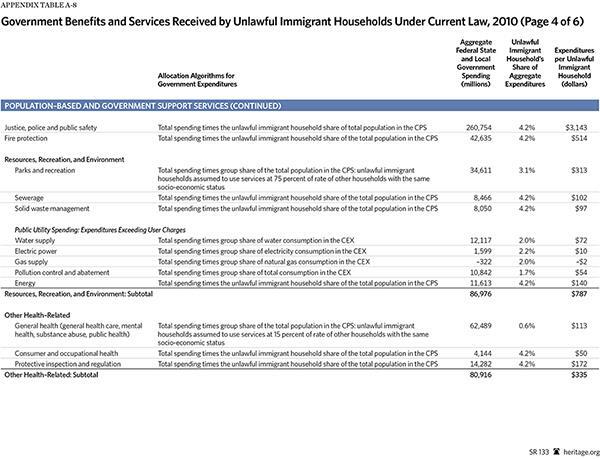 This equals the total benefits and services received by all unlawful immigrant households minus the total taxes paid by those households. 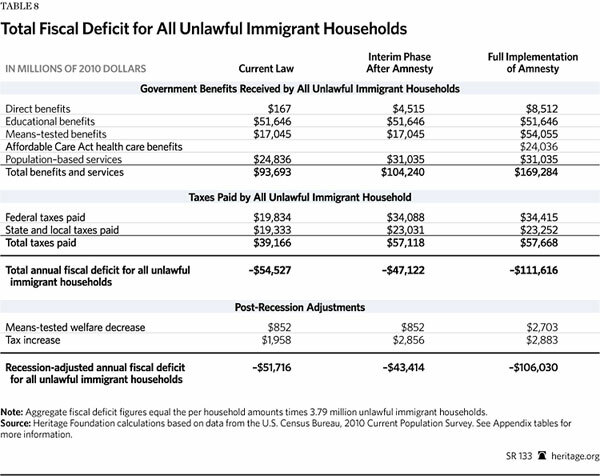 Under current law, all unlawful immigrant households together have an aggregate annual deficit of around $54.5 billion. In the interim phase (roughly the first 13 years after amnesty), the aggregate annual deficit would fall to $43.4 billion. At the end of the interim phase, former unlawful immigrant households would become fully eligible for means-tested welfare and health care benefits under the Affordable Care Act. The aggregate annual deficit would soar to around $106 billion. 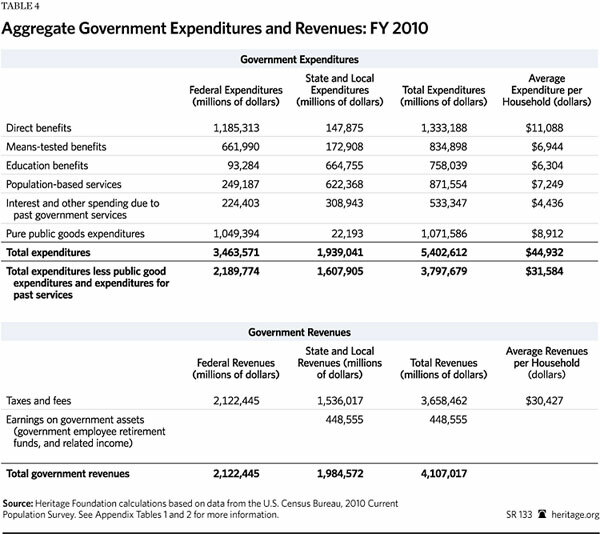 In the retirement phase, the annual aggregate deficit would be around $160 billion. It would slowly decline as former unlawful immigrants gradually expire. The typical unlawful immigrant is 34 years old. After amnesty, this individual will receive government benefits, on average, for 50 years. Restricting access to benefits for the first 13 years after amnesty therefore has only a marginal impact on long-term costs. 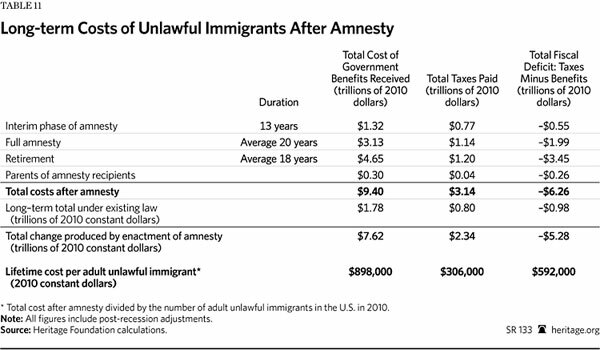 If amnesty is enacted, the average adult unlawful immigrant would receive $592,000 more in government benefits over the course of his remaining lifetime than he would pay in taxes. 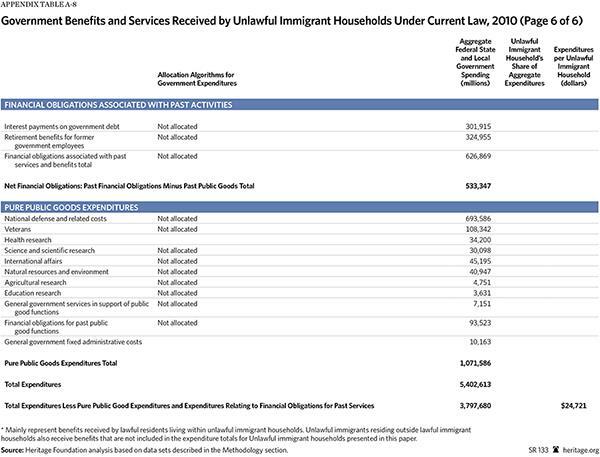 Over a lifetime, the former unlawful immigrants together would receive $9.4 trillion in government benefits and services and pay $3.1 trillion in taxes. 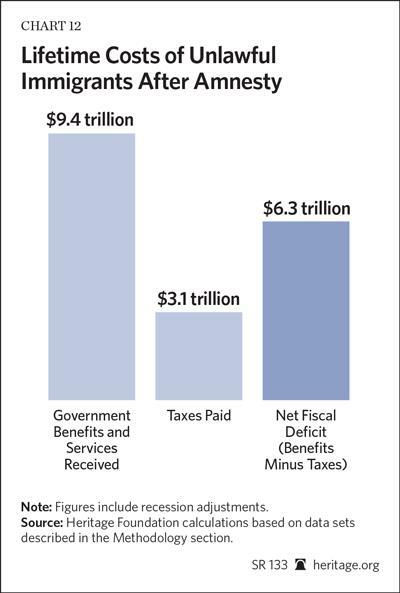 They would generate a lifetime fiscal deficit (total benefits minus total taxes) of $6.3 trillion. (All figures are in constant 2010 dollars.) This should be considered a minimum estimate. 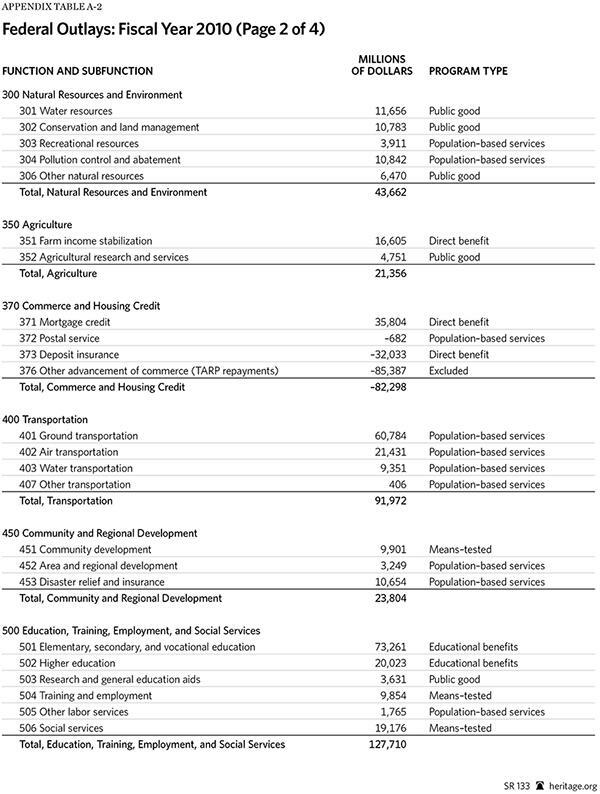 It probably understates real future costs because it under-counts the number of unlawful immigrants and dependents who will actually receive amnesty and underestimates significantly the future growth in welfare and medical benefits. The debate about the fiscal consequences of unlawful and low-skill immigration is hampered by a number of misconceptions. Few lawmakers really understand the current size of government and the scope of redistribution. 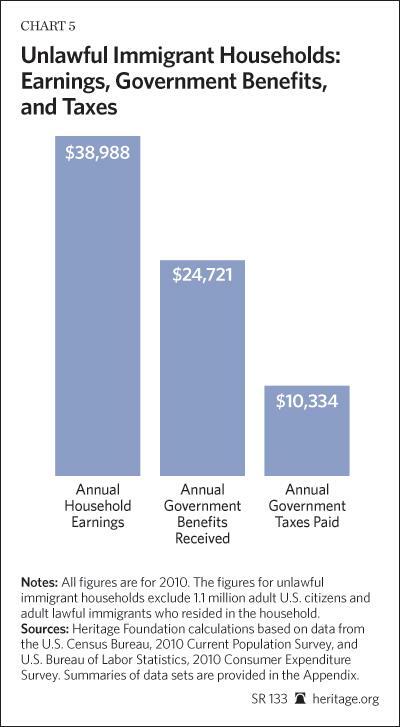 The fact that the average household gets $31,600 in government benefits each year is a shock. The fact that a household headed by an individual with less than a high school degree gets $46,600 is a bigger one. Many conservatives believe that if an individual has a job and works hard, he will inevitably be a net tax contributor (paying more in taxes than he takes in benefits). In our society, this has not been true for a very long time. Similarly, many believe that unlawful immigrants work more than other groups. This is also not true. 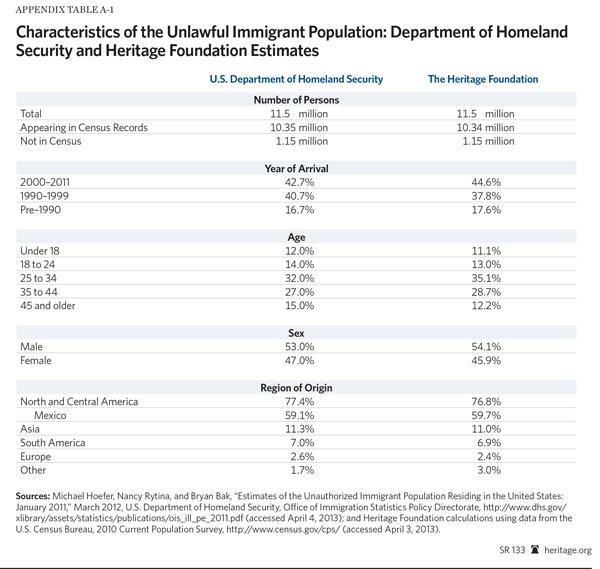 The employment rate for non-elderly adult unlawful immigrants is about the same as it is for the general population. Many policymakers also believe that because unlawful immigrants are comparatively young, they will help relieve the fiscal strains of an aging society. Regrettably, this is not true. 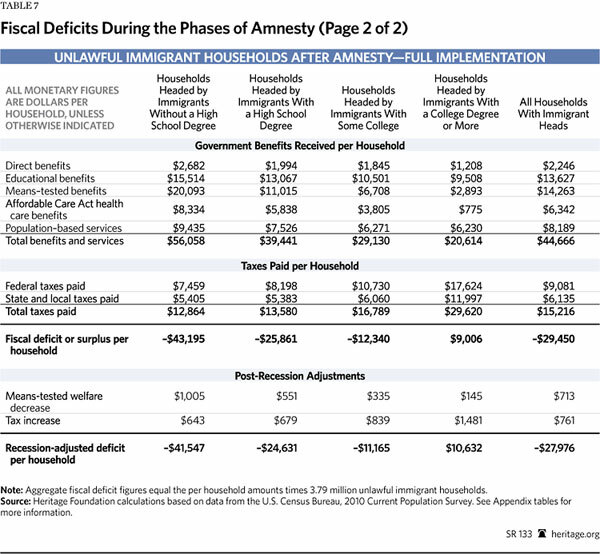 At every stage of the life cycle, unlawful immigrants, on average, generate fiscal deficits (benefits exceed taxes). 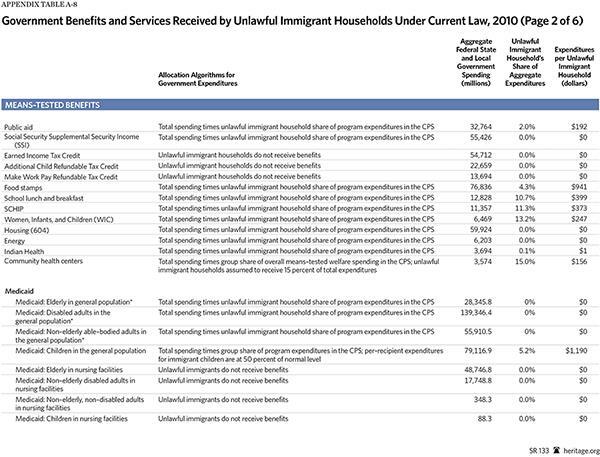 Unlawful immigrants, on average, are always tax consumers; they never once generate a “fiscal surplus” that can be used to pay for government benefits elsewhere in society. This situation obviously will get much worse after amnesty. Many policymakers believe that after amnesty, unlawful immigrants will help make Social Security solvent. It is true that unlawful immigrants currently pay FICA taxes and would pay more after amnesty, but with average earnings of $24,800 per year, the typical unlawful immigrant will pay only about $3,700 per year in FICA taxes. After retirement, that individual is likely to draw more than $3.00 in Social Security and Medicare (adjusted for inflation) for every dollar in FICA taxes he has paid. Moreover, taxes and benefits must be viewed holistically. It is a mistake to look at the Social Security trust fund in isolation. 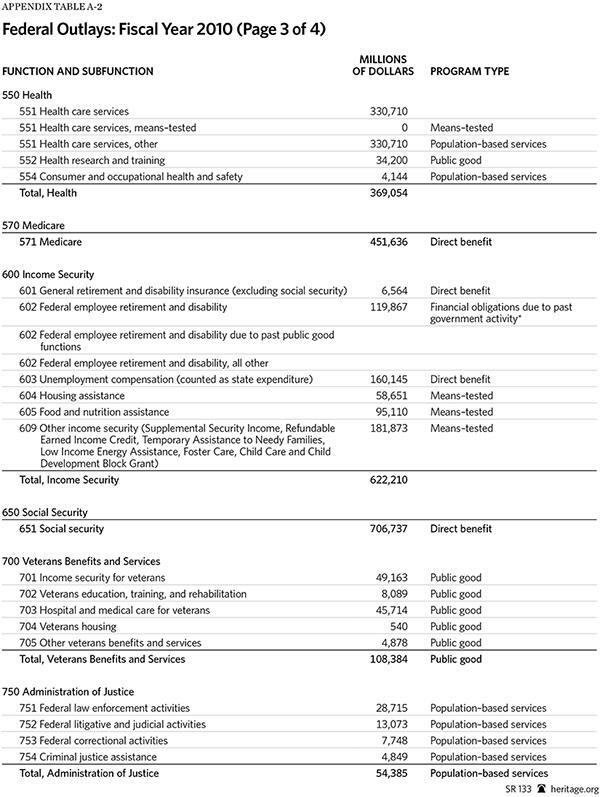 If an individual pays $3,700 per year into the Social Security trust fund but simultaneously draws a net $25,000 per year (benefits minus taxes) out of general government revenue, the solvency of government has not improved. 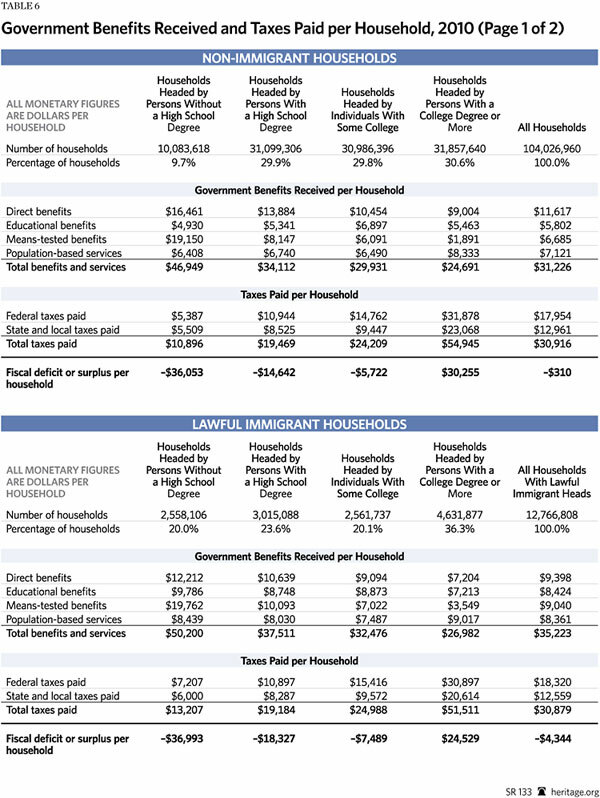 Following amnesty, the fiscal costs of former unlawful immigrant households will be roughly the same as those of lawful immigrant and non-immigrant households with the same level of education. 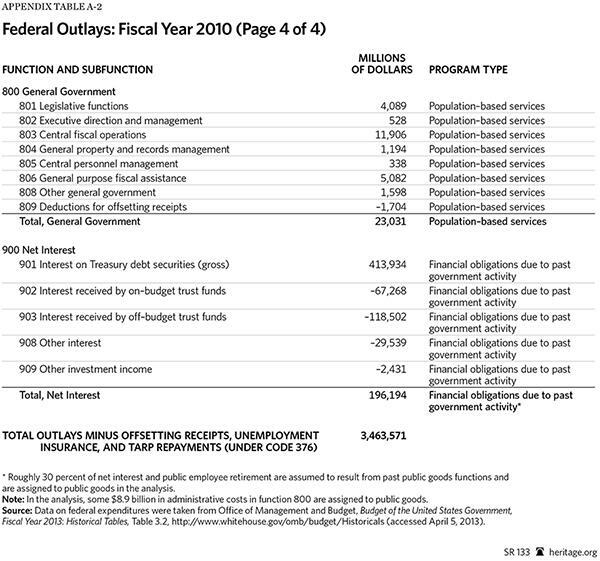 Because U.S. government policy is highly redistributive, those costs are very large. Those who claim that amnesty will not create a large fiscal burden are simply in a state of denial concerning the underlying redistributional nature of government policy in the 21st century. 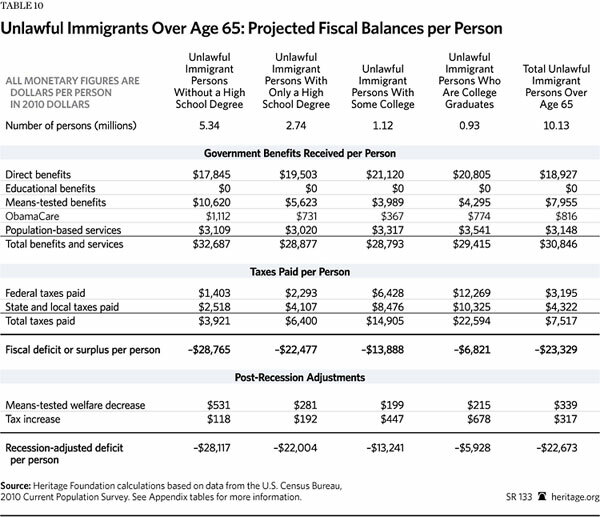 Finally, some argue that it does not matter whether unlawful immigrants create a fiscal deficit of $6.3 trillion because their children will make up for these costs. This is not true. Even if all the children of unlawful immigrants graduated from college, they would be hard-pressed to pay back $6.3 trillion in costs over their lifetimes. Of course, not all the children of unlawful immigrants will graduate from college. Data on intergenerational social mobility show that, although the children of unlawful immigrants will have substantially better educational outcomes than their parents, these achievements will have limits. Only 13 percent are likely to graduate from college, for example. Because of this, the children, on average, are not likely to become net tax contributors. 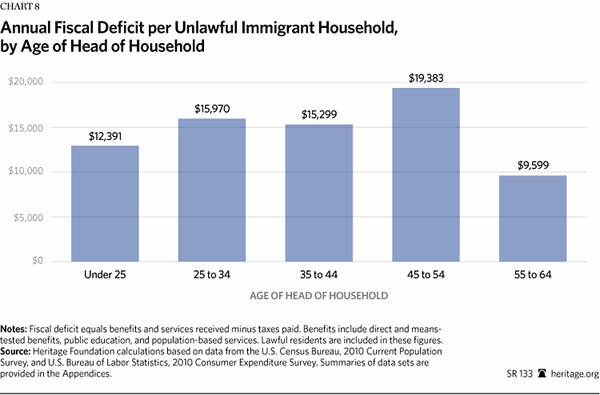 The children of unlawful immigrants are likely to remain a net fiscal burden on U.S. taxpayers, although a far smaller burden than their parents. Each year, families and individuals pay taxes to the government and receive back a wide variety of services and benefits. A fiscal deficit occurs when the benefits and services received by one group exceed the taxes paid. When such a deficit occurs, other groups must pay for the services and benefits of the group in deficit. Each year, therefore, government is involved in a large-scale economic transfer of resources between different social groups. Fiscal distribution analysis measures the distribution of total government benefits and taxes in society. 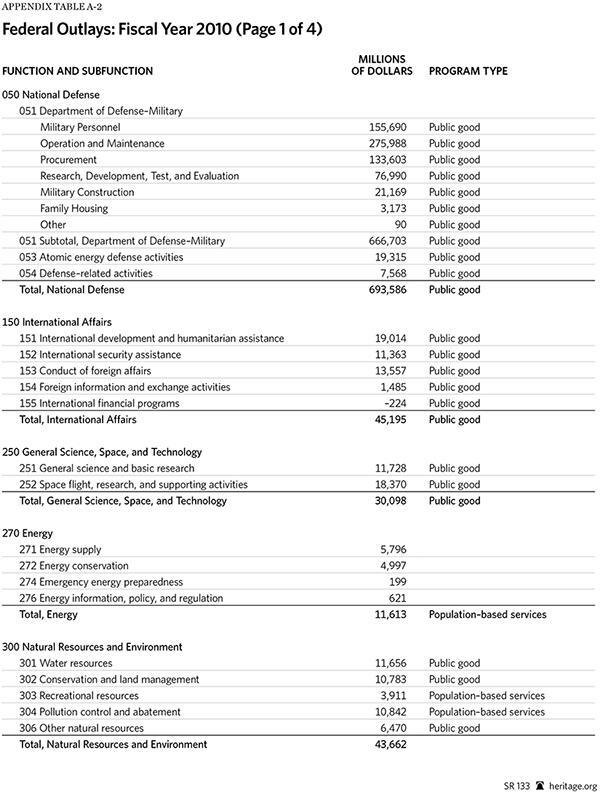 It provides an assessment of the magnitude of government transfers between groups. This paper provides a fiscal distribution analysis of households headed by unlawful immigrants: individuals who reside in the U.S. in violation of federal law. 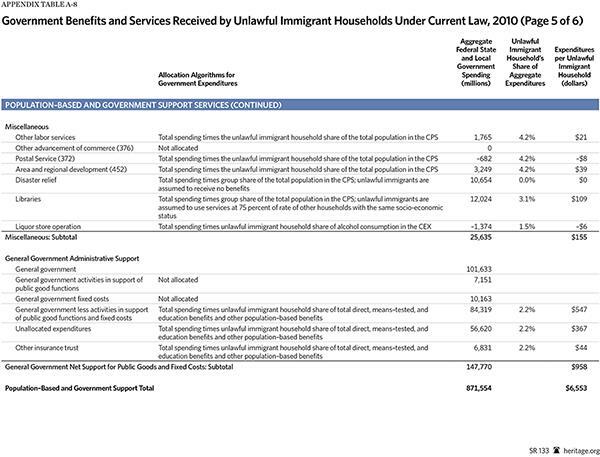 The paper measures the total government benefits and services received by unlawful immigrant households and the total taxes paid. 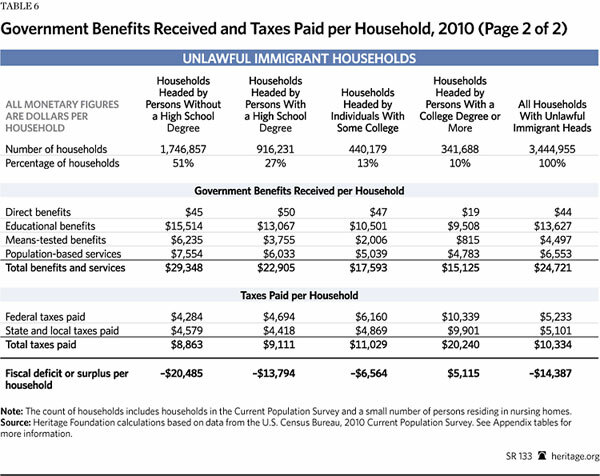 The difference between benefits received and taxes paid represents the total resources transferred by government on behalf of unlawful immigrants from the rest of society. The United States offers enormous economic opportunities and societal benefits. Countless more people would immigrate to the U.S. if they had the opportunity. Given this context, the U.S. must be selective in its immigration policy. Policymakers must ensure that the interaction of welfare and other financial transfer programs with immigration does not expand the fiscally dependent population, thereby imposing large costs on American society. 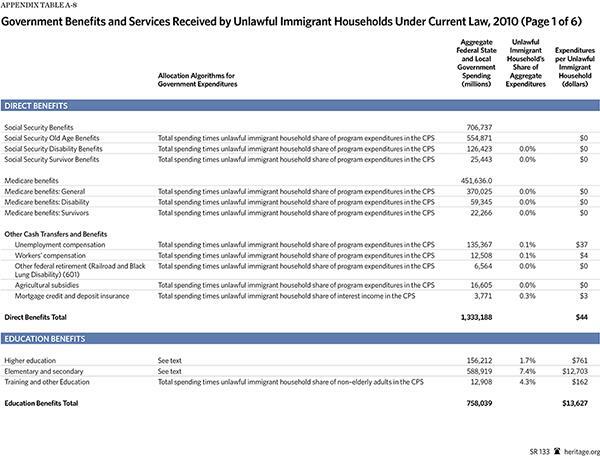 Current immigration policies with respect to both lawful and unlawful immigration encourage the entry of a disproportionate number of poorly educated immigrants into the U.S. As these low-skill immigrants (both lawful and unlawful) take up residence, they impose a substantial tax burden on U.S. taxpayers. 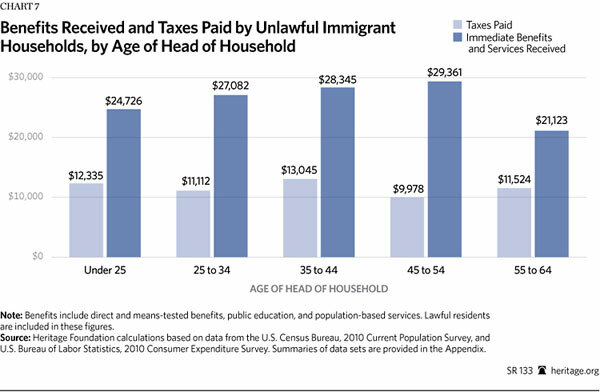 The benefits received by unlawful and low-skill immigrant households exceed taxes paid at each age level; at no point do these households pay more in taxes than they receive in benefits. Current immigration practices, both lawful and unlawful, operate like a system of transnational welfare outreach, bringing millions of fiscally dependent individuals into the U.S. This policy needs to be changed. U.S. immigration policy should encourage high-skill immigration and strictly limit low-skill immigration. In general, government policy should limit immigration to those who will be net fiscal contributors, avoiding those who will increase poverty and impose new costs on overburdened U.S. taxpayers.